Shibori is a technique used all over the world and involves folding, pleating, binding or using some kind of resist and then dyeing, most commonly in indigo, which results is an organic blue and white patterned piece of art with which to work. 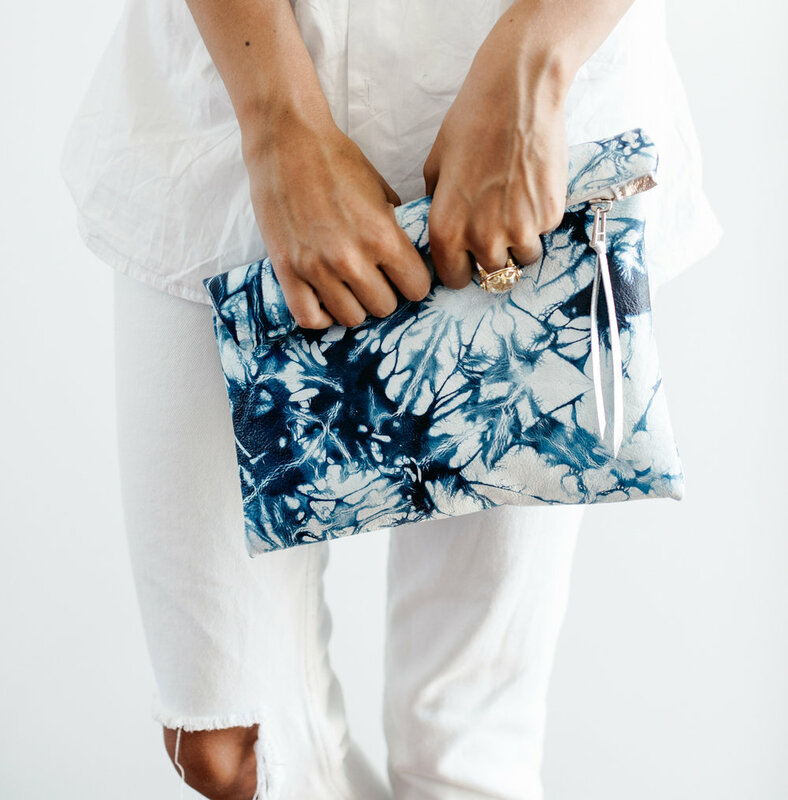 KARMME clutches are lined using this hand dyed 100% cotton fabric ensuring no two can ever be the same. Karen & Pepa from Boutique Textile agency, Shibori Textiles in Sydney are the pioneers in taking this technique and applying it to leather. In collaboration with Shibori Textiles this beautiful range was developed. Premium Italian leather is either hand bound in various techniques and dyed, or a watercolour or wax resist technique is applied to create a truly unique piece of art that is then transformed into a functional piece to be used and enjoyed. Blue and white and grey and white, these three are the original in shibori designs. GLACIAL and BELIEF have organic lines that usually run horizontally across the clutch and AZURE's design could be shattered glass, or sparkly seas. Using a watercolour dyeing technique the pattern created is very much determined by where the dye settles. Bleeds from black, to deep bluish grey fade into silvery grey in a stunning piece of art that creates two clutches depending which way you hold it.